The Passion Tree: The Passion Tree daily devotional starts tomorrow! Sign up now. The Passion Tree daily devotional starts tomorrow! Sign up now. Enjoy our Passion Tree Devotional Blog. Each day we will post one of the devotionals that corresponds to the “events” on the ornaments of the painting, The Passion Tree. Great way to prepare our hearts to truly celebrate the Christ of Christmas. The "THE PASSION TREE" painting follows the story of the Bible from Genesis to Revelation. Each ornament illustrates an event in history. The red garland represents the crimson thread of Jesus Christ woven through the entire Bible. Jesus IS from eternity (before Creation) to eternity (after the end of all things), and this garland weaves through all history, showing His Story. 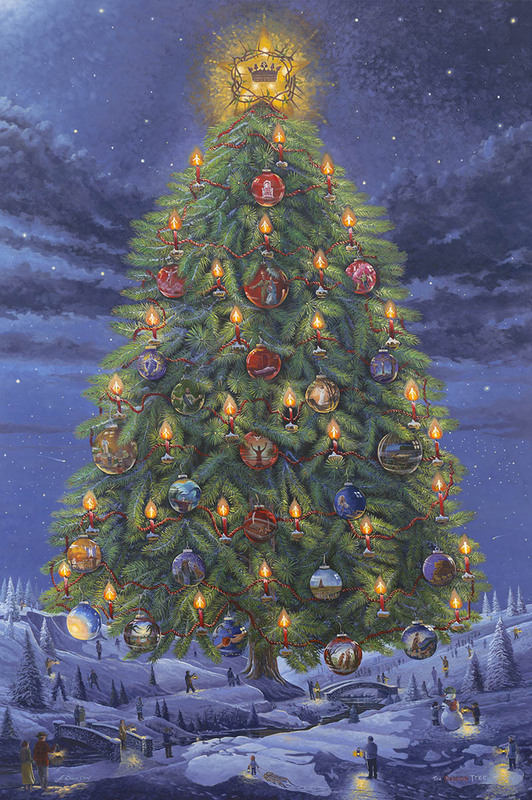 The first twelve ornaments show events in the Old Testament and the last twelve illustrate events in the New Testament, and a star representing the glory of God crowns the tree. There are 33 candles, one for each of the years that Christ spent on earth in the form of a man. You can see a suggestion of Christ in each flame . The red ornaments down the center and across form a cross. The three largest ornaments represent the trinity: God the Father gave His gift, the Son who came to earth, and God the Spirit lives within believers today. Use this as an advent calendar, reading and studying one a day from December 1 through December 25.